Yesterday morning I closed Julian Barnes’s intelligent and witty meditation on death and dying, Nothing to be Frightened Of. It was a second reading. There aren’t many second readings in my literary history. There are too many unread books vying for fresh attention. But occasionally something about a book draws me back. With Barnes it was technical. I couldn’t put my finger on how he had done it, how he’d written such a well-informed book while also making it so richly personal and intimate. Reading it again pulled the curtain back and afforded me a view I couldn’t appreciate the first go round. That accomplished, I closed Barnes and picked up Edmund White‘s little biography of Marcel Proust. It is one of Penguin Lives biographies. If you’re not familiar with the Penguin Lives editions you may want to check it out. The series is a growing collection of short (150 pages give or take) biographies by respected scholars and writers on individuals of interest. There is Larry McMurty on Crazy Horse, Garry Wills on St. Augustine, Karen Armstrong on the Buddha, among many others. The biographies afford the reader a pithy overview of a life. I was finished with White’s Proust by dinner, something, I daresay, which would have made the verbose Proust double over with laughter. He had an odd habit, I read in the mini-bio, of laughing at a joke long past everyone else. I read Proust about two years ago. To be precise, I read Swann’s Way, the first–450 page–volume of the 4500 page novel, “Remembrance of Things Past”. Some editions titled it, “In Search of Lost Time”. “For a long time I used to go to bed early,” begins the Moncrieff edition. Reading White prompted me to pull Proust off the shelf. I weigh it in my hand, toying with the notion of re-reading it. I open it and glance at the flyleaf. In the delicate script of my mother’s hand I see a notation: From Mom & Dad, 12-25-81. 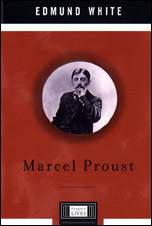 Of Proust, White writes: “…he had more faith in the senses and in memory than in the intellect to experience ultimate truths.” It is supremely fitting that advancing those 4500 pages, etched in a thin fading ink, a memory is launched with a simple inscription, in my mother’s handwriting. Proust would have stopped laughing and, I hope, agreed. Supremely fitting. I share your admiration for the Julian Barnes memoir. A really wonderful book. It truly is wonderful. What a surprise it was, not that I should have been surprised by Barnes. Thanks for stopping by.